Reportback about a demonstration in solidarity with Afrin in Ljubljana, Slovenia on March 21. 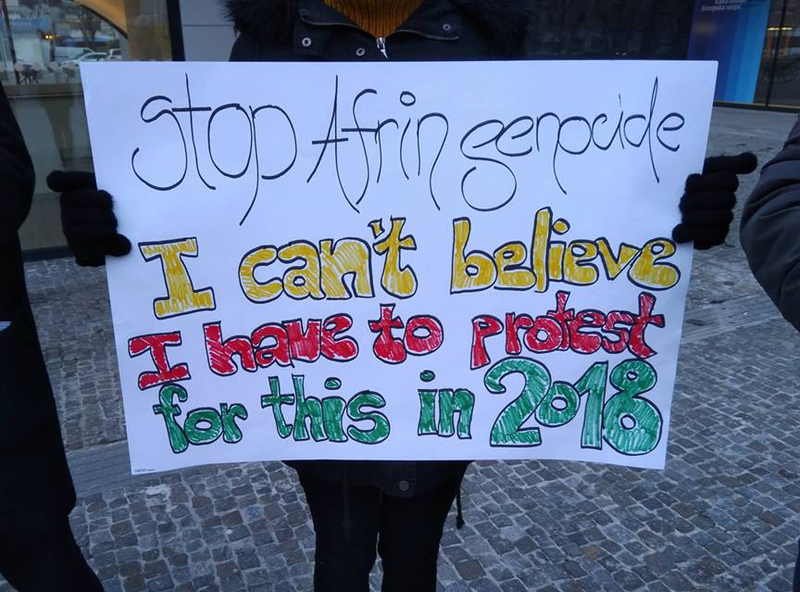 On Wednesday, March 21st, the citizens of Ljubljana took to the streets in order to prompt the institutions relevant in the context of stopping the Turkish invasion of Afrin to react. Another aim of the demonstration (Warning Facebook link) was to draw attention to the blatant human rights violations at the hands of Turkey both inside and outside its borders. The protesters gathered on March 21st, the date usually associated with Newroz, because of the symbolic meaning of the said holiday and its political connotations regarding the struggle against state oppression that the Kurds experience in Turkey. It is important to note that the Afrin invasion, known as “Operation Olive Branch“, began on January 20th this year and was presented by the Turkish authorities as an anti-terrorist, defense operation aimed at maintaining the territorial sovereignty of the state. Recep Tayyip Erdoğan himself proclaimed the invasion of Afrin a mission to “strangle a terror army before it’s even born.“ However, according to the available data, over a two-month period, these ‘defensive attacks’ on this north Syrian city have taken nearly 300 civilian lives, of which 43 victims were children who died in the bombings. As a city that suffered the least amount of destruction at the hand of the Islamic State, until recently Afrin also provided shelter to numerous refugees who left their homes fleeing the jihadist terror, but it in a way also represented a bastion of the newly-formed democracy that the Democratic Federation of North Syria is trying to establish. After the Turkish backed rebels gained control of the city this Sunday and the scenes of tearing down monuments and rampant looting, as well as videos (Warning Facebook link) of deliberately humiliating of civilians spread through various media during the past few days, the conquering nature of the “Olive Branch” operation became all but invisible. The material damage suffered by the city is extremely large, and about 220 000 civilians are (again) forced into exile. It is also quite easy to notice that the acts in which the Turkish army engaged, such as the massacre and the expulsion of Kurdish civilians from the territory of northern Syria via the air strikes, could easily be characterized as not only a war crime and an act of ethnic cleansing, but also an active attempt to suffocate the very idea of democracy and equality currently present in Rojava. As such, the Turkish invasion, in a certain way, represents the manifestation of the totalitarian aspirations of the present Turkish government, also visible within the Turkish borders and characterized by a series of unfounded persecutions of ‘unsuitable’ citizens that began after a coup attempt in 2016.
demonstrations throughout Europe, the reaction of the state officials around the world regarding the blatantly obvious violations of human rights by Turkey has largely fallen out. Any concrete attempts to stop the armed invasion of Afrin and prevent further civilian casualties are still almost non-existent. In order to express their dissatisfaction with Erdoğan’s regime (shared by many others around the world), Kurdish and Turkish diaspora, as well as numerous Slovenian activists who are aware of the importance of international solidarity in the struggle for human rights, walked through the streets of Ljubljana carrying posters adorned by slogans such as: “Stop Afrin genocide!“, “Turkey is not a safe state!“, “Europe, you should be ashamed of yourself!“ and many others. 2.Declare a no-fly zone for Afrin! 3.Stop arms trade with Turkey! 4.Recognize the Democratic Federation of Northern Syria as a legitimate entity! 5.Terminate the EU – Turkey agreement regarding asylum seekers! 6.Remove Turkey from the list of safe countries (which is in Slovenia ofter used as a reason for returning asylum seekers back to Turkey)! Aside from trying to pressure relevant institutions into reacting and stopping the Afrin invasion, the protesters also used this opportunity to draw the attention of Slovenian authorities towards the dire political situation in Turkey, which now eerily resembles a totalitarian dictatorship, in order to prompt them to approve asylum requests of the politically or ethnically motivated refugees who were forced to leave Turkey and settle in Slovenia. Despite the fact that the number of political prisoners in Turkey (including a large number of journalists, academics and various civil servants), mostly accused of participating in the work of the Kurdistan Workers Party or being Gülenists, has not stopped growing since the coup attempt in 2016 and currently stands at 133 257 detainees and 64,998 arrested citizens (out of whom about 600 are children locked away together with their mothers), Slovenia assesses Turkey as completely safe. In spite of various testimonies of torturing and murdering prisoners, the Slovenian authorities continue to consider the fear many asylum seekers experience at the thought of returning to Turkey unconvincing and unfounded. Stopping the Turkish invasion is absolutely necessary at this moment. In order for the requests of protesters to reach further than the streets of Ljubljana, the organizers announced that the discussion regarding the situation in Turkey and Syria will be opened by the leftist party Levica in the Slovenian parliament on the 22nd of March. Katarina Pavičić-Ivelja, a Croatian journalist interested in political topics and various human right’s issues as well as an array of topics concerning feminism with an emphasis on the women’s liberation in Rojava.